The goal of the Choir is to perform musically in a professional manner. This is done by assisting the individual performer in accessing his inner world as to enable the optimal enhancement of his artistic performance. Through his experience in the musical world, provided by the Choir, the participant becomes more in touch with his surroundings; more tolerant and more empathetic. Rehearsals are held twice a week. They integrate activities in vocal training; body awareness; discovery of the voice within the body; singing; learning notes; performing in keeping with the Kodai and Oref methods; movement and acting. There are bi-weekly rehearsals that integrate activities in vocal training; body awareness; discovery of the voice within the body; singing together with the adolescent Choir; learning notes; puppet theatre; body drumming and stage performance. The Choir represents Israel in international competitions, festivals and tours Europe and the Far East. 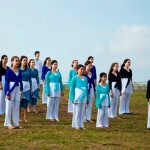 Israeli composers have written compositions that have been performed for the first time by the Choir. Within the framework of the Choir, participants can do matriculation examinations in music. The Li Ron Ensemble was formed in 2006. Most of the performers are graduates of the Youth Choir. The Ensemble performs modern Israeli music in addition to classical and folk. The Composer, Andre Hajdu dedicated a 6-part work called “When the Bible Smiles” to the Ensemble. Israeli composers who have come to the rehearsal hall to work with the Ensemble have noted the exceptional quality of the performance and the ability of the Ensemble to cope with a wide repertoire of acappella.